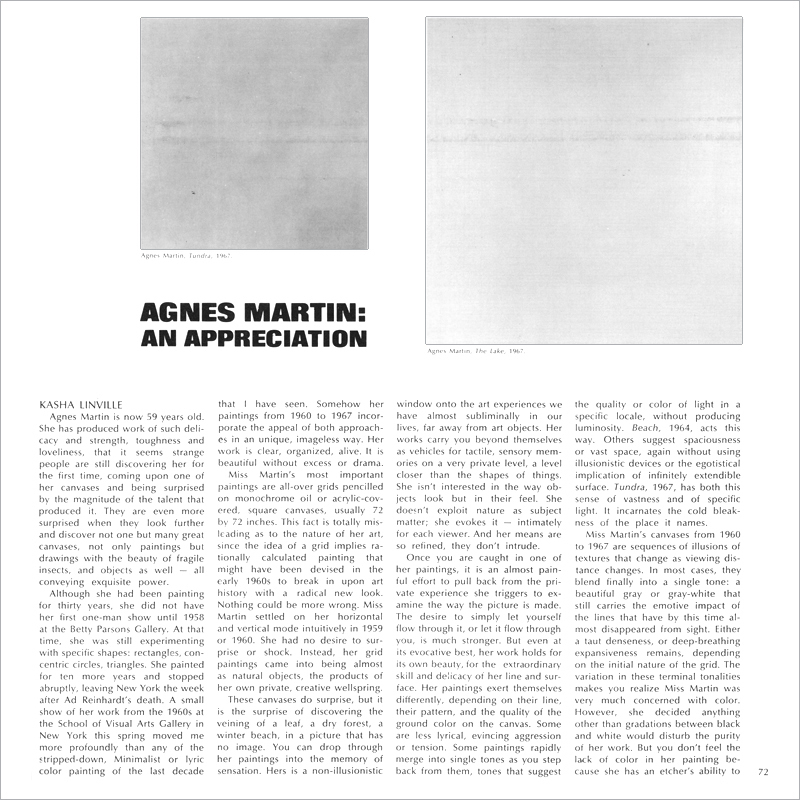 AGNES MARTIN IS NOW 59 years old. She has produced work of such delicacy and strength, toughness and loveliness, that it seems strange people are still discovering her for the first time, coming upon one of her canvases and being surprised by the magnitude of the talent that produced it. They are even more surprised when they look further and discover not one but many great canvases, not only paintings but drawings with the beauty of fragile insects, and objects as well all conveying exquisite power. Although she had been painting for thirty years, she did not have her first one-man show until 1958 at the Betty Parsons Gallery. At that time, she was still experimenting with specific shapes: rectangles, concentric circles, triangles. She painted for ten more years and stopped abruptly, leaving New York the week after Ad Reinhardt’s death. A small show of her work from the 1960s at the School of Visual Arts Gallery in New York this spring moved me more profoundly than any of the stripped-down, Minimalist or lyric color painting of the last decade that I have seen. Somehow her paintings from 1960 to 1967 incorporate the appeal of both approaches in an unique, imageless way. Her work is clear, organized, alive. It is beautiful without excess or drama. Miss Martin’s most important paintings are all over grids pencilled on monochrome oil or acrylic-covered, square canvases, usually by 72 inches. This fact is totally misleading as to the nature of her art, since the idea of a grid implies rationally calculated painting that might have been devised in the early 1960s to break in upon art history with a radical new look. Nothing could be more wrong. Miss Martin settled on her horizontal and vertical mode intuitively in 1959 or 1960. She had no desire to surprise or shock. Instead, her grid paintings came into being almost as natural objects, the products of her own private, creative wellspring. These canvases do surprise, but it is the surprise of discovering the veining of a leaf, a dry forest, a winter beach, in a picture that has no image. You can drop through her paintings into the memory of sensation. Hers is a non-illusionistic window onto the art experiences we have almost subliminally in our lives, far away from art objects. Her works carry you beyond themselves as vehicles for tactile, sensory memories on a very private level, a level closer than the shapes of things. She isn’t interested in the way objects look but in their feel. She doesn’t exploit nature as subject matter; she evokes it intimately for each viewer. And her means are so refined, they don’t intrude. Once you are caught in one of her paintings, it is an almost painful effort to pull back from the private experience she triggers to examine the way the picture is made. The desire to simply let yourself flow through it, or let it flow through you, is much stronger. But even at its evocative best, her work holds for its own beauty, for the extraordinary skill and delicacy of her line and surface. Her paintings exert themselves differently, depending on their line, their pattern, and the quality of the ground color on the canvas. Some are less lyrical, evincing aggression or tension. Some paintings rapidly merge into single tones as you step back from them, tones that suggest the quality or color of light in a specific locale, without producing luminosity. Beach, 1964, acts this way. Others suggest spaciousness or vast space, again without using illusionistic devices or the egotistical implication of infinitely extendible surface. 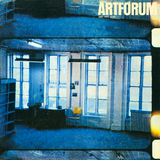 Tundra, 1967, has both this sense of vastness and of specific light. It incarnates the cold bleakness of the place it names. Miss Martin’s canvases from 1960 to 1967 are sequences of illusions of textures that change as viewing distance changes. In most cases, they blend finally into a single tone: a beautiful gray or gray white that still carries the emotive impact of the lines that have by this time almost disappeared from sight. Either a taut denseness, or deep-breathing expansiveness remains, depending on the initial nature of the grid. The variation in these terminal tonalities makes you realize Miss Martin was very much concerned with color. However, she decided anything other than gradations between black and white would disturb the purity of her work. But you don’t feel the lack of color in her painting because she has an etcher’s ability to create tone and even hue through variations in the darkness, crispness, thickness and density of her lines. Line is where she speaks most personally. It is her vocabulary as the grids are her syntax. She shows such sensitivity to subtle differences in touch that the tactility of her paintings increase by inference. At close range, you can feel her hand moving, her touch-judgments. She makes touch tangible and visible. Sometimes her line is sharp, as in an early painting, Flowers in the Wind, 1963. Sometimes its own shadow softens it that is, it is drawn once beneath the pigment or gesso and then redrawn on top, as in The Beach. Most often, her line respects the canvas grain, skimming its surface without filling the low places in the fabric so it becomes almost a dotted or broken line at close range. Sometimes she uses pairs of lines that dematerialize as rapidly as the lighter drawn single ones. 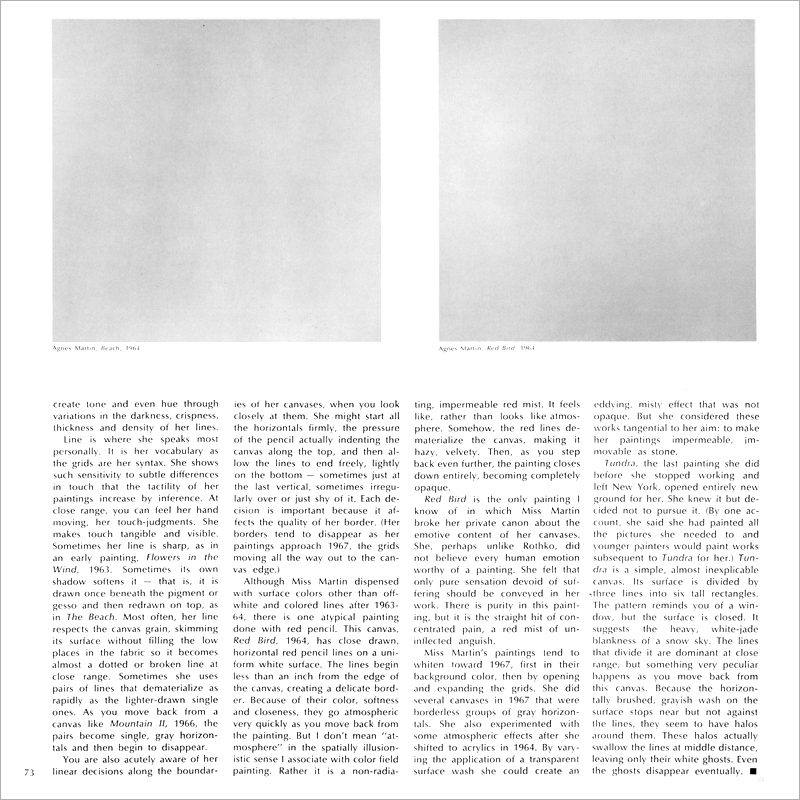 As you move back from a canvas like Mountain II, 1966, the pairs become single, gray horizontals and then begin to disappear. Although Miss Martin dispensed with surface colors other than off white and colored lines after 1963-64, there is one atypical painting done with red pencil. This canvas, Red Bird, 1964, has close drawn, horizontal red pencil lines on a uniform white surface. The lines begin less than an inch from the edge of the canvas, creating a delicate border. Because of their color, softness and closeness, they go atmospheric very quickly as you move back from the painting. But I don’t mean “atmosphere” in the spatially illusionistic sense I associate with color field painting. Rather it is a non-radiating, impermeable red mist. It feels like, rather than looks like atmosphere. Somehow, the red lines dematerialize the canvas, making it hazy, velvety. Then, as you step back even further, the painting closes down entirely, becoming completely opaque. Red Bird is the only painting I know of in which Miss Martin broke her private canon about the emotive content of her canvases. She, perhaps unlike Rothko, did not believe every human emotion worthy of a painting. She felt that only pure sensation devoid of suffering should be conveyed in her work. There is purity in this painting, but it is the straight hit of concentrated pain, a red mist of uninflected anguish. Miss Martin’s paintings tend to whiten toward 1967, first in their background color, then by opening and expanding the grids. She did several canvases in 1967 that were borderless groups of gray horizontals. She also experimented with some atmospheric effects after she shifted to acrylics in 1964. By varying the application of a transparent surface wash she could create an eddying, misty effect that was not opaque. But she considered these works tangential to her aim: to make her paintings impermeable, immovable as stone. Tundra, the last painting she did before she stopped working and left New York, opened entirely new ground for her. She knew it but decided not to pursue it. (By one account, she said she had painted all the pictures she needed to and younger painters would paint works subsequent to Tundra for her.) Tundra is a simple, almost inexplicable canvas. Its surface is divided by three lines into six tall rectangles. The pattern reminds you of a window, but the surface is closed. It suggests the heavy, white jade blankness of a snow sky. The lines that divide it are dominant at close range, but something very peculiar happens as you move back from this canvas. Because the horizontally brushed, grayish wash on the surface stops near but not against the lines, they seem to have halos around them. These halos actually swallow the lines at middle distance, leaving only their white ghosts. Even the ghosts disappear eventually.